12-inch diameter reflector for Ascorlight CD 1200 and CD 2400 flash systems. New special offers are available! The 12" reflector provides a 55° angle of coverage, useful for main or fill light in portraiture and small product shots. These reflectors fit the 061-230 Universal flash head as used with the Ascorlight CD 1200 and CD 2400 power packs. 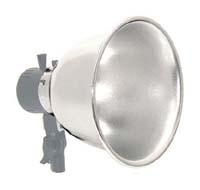 They will also fit Sunpak MS-series monolights. Canada's Enlarger and Darkroom Specialists!